I'm a fan of royals, especially queens, and basically all things British. I majored in history and spent a couple of semesters learning English history, pre and post Henry VIII, and mostly the Elizabethan period. I love movies, books and an opera about the period. I've been to castles and cathedrals in England. I've seen the tombs of Queen Elizabeth I and Mary, Queen of Scots at Westminster Abbey. I knew most of the history of the complicated period. Despite the fact that they were cousins, I also knew that Elizabeth and Mary never met, even while their lives were very much intertwined in a struggle for power. So, while I thought I knew this story, I was not prepared for the power of Friedrich Schiller's Mary Stuart. 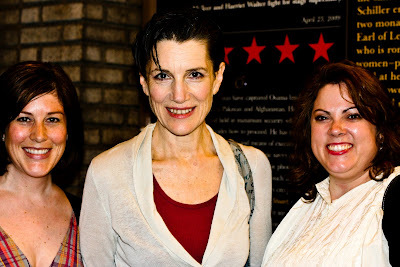 I first saw Mary Stuart on June 3rd. I had the opportunity to return last Friday, July 3rd. A month in between did nothing but intensify the experience for me. The original text is powerful, but this translation by Peter Oswald is stunning. From the very first moment that Elizabeth's men take the stage, practically without warning as the lights in the house have not even dimmed, I was immediately transported. It's very telling that all of the men in the play are dressed in modern day suits. They are G men and yes men. Comfortable in their attire, they control every situation as well as women, or at least they attempt to do so. The women, only three - Elizabeth and Mary, the Queens, and Hannah, Mary's loyal nurse and friend, are dressed in period costume. Their dresses are of oppressive and binding. They are controlled by their attire and the men surrounding them, even though in name, they are the rightful rulers. Although the play is titled Mary Stuart and is centered around the struggle of Mary to save her own life, it's as much or even more about Elizabeth and her own struggle to gain control as a ruler. The story is a maelstrom of Catholic vs. Protestant, male vs. female, and especially loyalty vs. hypocracy. It seems no character ever has complete control and it is not until the end that the twist grabs you and throws you over with its shocking ending. And even though I knew this story, to see it come alive, even in a re-telling of what if the two queens did meet, was a thing of beauty, symmetry and pure poetry of words, light and shadows. The queens are played by two extraordinary British actresses: Janet McTeer as Mary and Harriet Walter as Elizabeth. 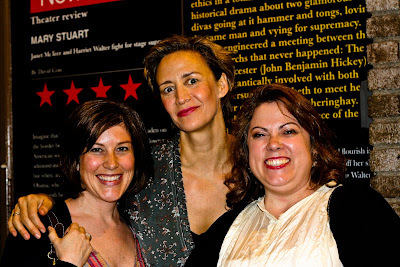 The greatest gift of this theatrical season on Broadway, and there have been many, is Harriet Walter and her peer Janet McTeer. I am in awe of their theatrical power. From minute one of taking the stage, Janet is at a peak, the highest of energy and power, at all times showing the pain and fear of Mary, until the very end when there is nothing but calm acceptance. Harriet is the even tempered one, low key and even though you feel Elizabeth's fear and indecision, her understated preciseness on stage translates to larger than life. 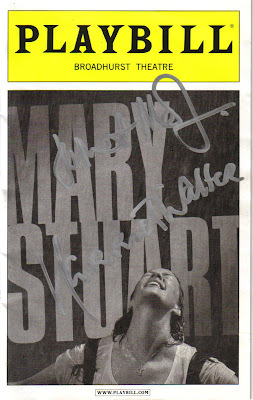 I will go see the power of Mary Stuart at least one more time, on August 1st. If there is only one drama you can see this season, GO to this one. There's a discount , so there's no excuse. You only have until August 16th, or it's to the tower with you! Pictures courtesy of Kari, who tells the rest of the story here. Have you seen/heard Mary Stuarda? Am so looking forward to this. What you have just written has heightened my excitement. It just seems like GOOD drama. Glad to know I am not alone! I saw MS in May, and have returned to NY this week (I live in the Midwest) to see it again. For God's Sake, is it surprising? My friends think I am nuts. It is such a rare treat to see this play, and to see two great actresses in it, that once was definitely not enough. Shari, you are neither nuts nor alone! It is surprising and is so fabulous and consuming. Enjoy your 2nd time. I feel so blessed to be "in" on the joke, having been at the party. Kari's blog update just provided me with a much needed laugh for today. Does Devia ever come stateside or is she primarily in Europe? I've seen some of her Lucrezia on the tube and she's something fierce! Followup--saw the show last Thursday and was amazed at some of the differences relative to my visit in May. The "trial" scene was even tighter and more tense, with a slower build than it seemed in May. The McTeer bobbled my favorite line a bit (left off the "for god's sake" before "is it surprising"), but somehow that worked. Met JM the day before and after the show for pix and the signing of many posters; she was delightful. HW wasn't feeling well so the chat opportunity was unsatisfying, but her performance was flawless. Her Eliza showed a tentative sympathy for Mary at moments that made the whole thing richer and even more emotionally riveting. And there are lawn chairs on Broadway now. Not sure I feel so good about that. Fabulous Ladies! All four of you.